Over the past two years, we’ve made public data easier to find, explore and understand in several ways, providing unemployment figures, population statistics and world development indicators in search results, and introducing the Public Data Explorer tool. Together with our data provider partners, we’ve curated 27 datasets including more than 300 data metrics. You can now use the Public Data Explorer to visualize everything from labor productivity (OECD) to Internet speed (Ookla) to gender balance in parliaments (UNECE) to government debt levels (IMF) to population density by municipality (Statistics Catalonia), with more data being added every week. Today, we’re opening the Public Data Explorer to your data. We’re making a new data format, the Dataset Publishing Language (DSPL), openly available, and providing an interface for anyone to upload their datasets. DSPL is an XML-based format designed from the ground up to support rich, interactive visualizations like those in the Public Data Explorer. 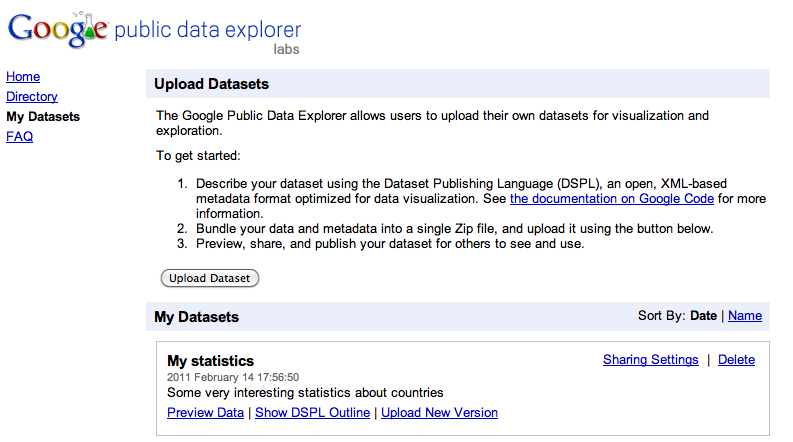 The DSPL language and upload interface are available in Google Labs. 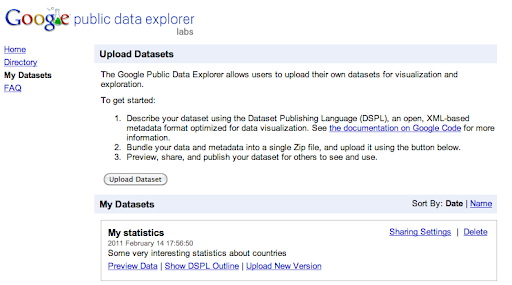 To upload a dataset, click on the “My Datasets” link on the left-hand side of the Public Data Explorer. Once imported, a dataset can be visualized, embedded in external websites, shared with others and published. If you’re an official provider, you can request that your datasets appear in the Public Data Explorer directory; please contact us to discuss this process. With this new capability, we hope more datasets can come to life through Public Data Explorer visualisations and enable people to better understand the world around them and make more informed, data-driven decisions. Stay tuned for more datasets, visualization features and DSPL extensions in the future.